A new photography competition has been launched by the Mayor of Ellesmere Port, Councillor Karen Shore. The competition celebrates business in Ellesmere Port, that is building a reputation as a magnet for businesses to thrive. It was launched at Thyson Technology, a specialist engineering business providing gas analysis solutions for process industries worldwide. Mike Braddock, Managing Director of Thyson Technology said: “We are delighted to help Cheshire West and Chester Council launch this year’s ‘Celebrating Business in Ellesmere Port’ competition. Whilst the town is well known for its industrial heritage and motor manufacturing, the recent urbanisation of Cheshire Oaks and its surrounding areas has seen businesses of all sectors and sizes thrive. 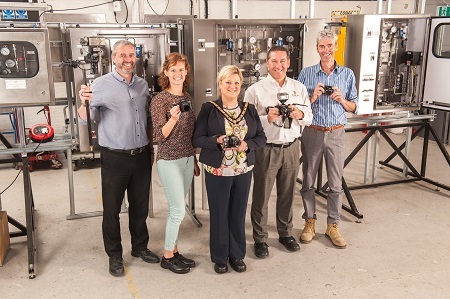 Local award winning professional photographer Adrian Waine took the photograph of the Mayor of Ellesmere Port visiting Thyson Technology. Cheshire College South & West was also present taking the opportunity with a student to take photographs inside the company. The photographic competition is open until 10 September 2018. To enter, send your images in jpeg format to: ellesmereportsp@cheshirewestandchester.gov.uk. Marks and Spencer gift vouchers will be awarded to the winners (first prize £200, second prize £75, third £25 and first prize for the young people category £100). For further information please see the notice board on the website of the Ellesmere Port Photographic Society, or email: Jochem.hollestelle@cheshirewestandchester.gov.uk.